Answer: I’m not positive, but I think I did see it once many years ago, sometime in the early 1970’s. I had my camera attached to the telescope that night, and I was taking photos of the Full Moon. Suddenly this object passed right in front of the Moon. I managed to get one quick shot, which you see reproduced above. I said “I’m not positive” since the image was blurred by thin clouds. 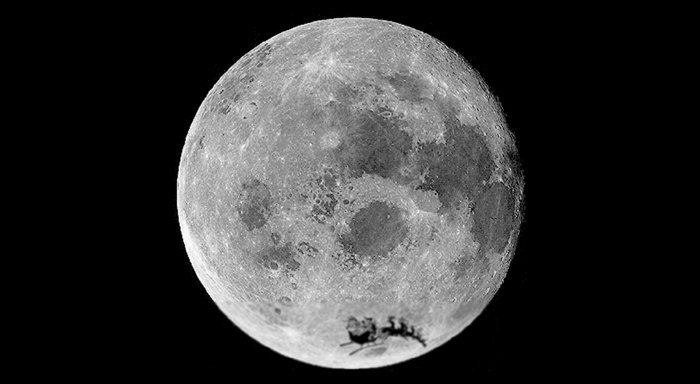 But you can definitely see something that might be a sleigh moving past the lower edge of the Moon. Santa’s sleigh is not an easy thing to see for several reasons. First and foremost, it doesn’t have any flashing lights like most aircraft are required to have for safety. Second, it’s not that large an object, even with 8 or 9 reindeer attached. Third, he only flies one night every year, and the night sky in December is often cloudy. What happened late that night back in the 70’s was pure luck. I just happened to have my telescope pointed in the right direction. Whatever I saw, it was was silhouetted against the bright lunar disc. I’ve seen this happen with birds and airplanes occasionally, but unless you’re already set up for photography there’s never enough time to get a camera attached and take a picture. It usually happens way too fast to react. So have I ever seen Santa’s sleigh? I think so. You are, of course, correct. Dasher, Dancer, Prancer, Vixen, Comet, Cupid, Donner, and Blitzen … or so the song goes. He adds Rudolph when he needs the red light for better visibility, which would make a maximum of 9. I have corrected my original post, which said there were 12 reindeer. I guess I confused that with the “12 Days of Christmas.” Thanks for catching the error, and Happy Holidays!